10% WINTER HOLIDAY SEASON DISCOUNT ON EVERY STOCK BOW UNTIL NEW YEAR!! This is a hand built longbow, made out of high quality materials. It is made by hand and I don't use templates for the design so each bow has a bit of it's own character even though I follow the same design principles. Bow has a dual purpose grip with a nice locator throat which allows you to grip it the same way every time. Dexterity - right handed Length - 66'. Recommended draw length - up to 30'' max. Limb overlays - Black glass Riser - Zebrano, Wenge Tips - Micarta, Zebrano. String - Dacron B-55 Finish - satin Poly Urethane. Just for clarity - the first picture is a thumbnail which may include another bow in it, rest of the pictures represent the actual bow in this listing Feel free to order a bow if any of my bows listed here do not meet your demands - I will send you full options list, it is really easy and you can get exactly what you want! I'm developing my skills to sell premium traditional bows for premium prices one day. Use this opportunity if you are looking to stand out on an archery range or just bored of factory made items. I have signed my name on every bow I have made so I stand by my product and all the great feedback I have received from archery enthusiasts over the Europe. Feel free to order a bow if any of my bows listed here do not meet your demands - I will send you full options list. The item "Handmade traditional longbow 40#@28'' archery 10% DISCOUNT SALE" is in sale since Friday, December 21, 2018. 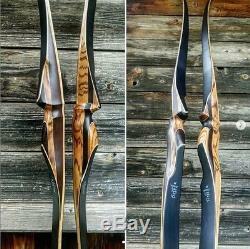 This item is in the category "Sporting Goods\Archery\Bows\Longbows". The seller is "balticbowyer" and is located in Madona, default. This item can be shipped to North, South, or Latin America, all countries in Europe, all countries in continental Asia, Australia.